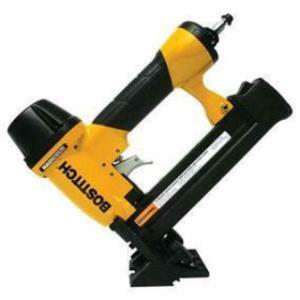 This Bostitch floor stapler is used for installing prefinished laminate flooring. The stapler uses 3/16" crown x 1" long staples, and requires a working PSI of 70-100. Stapler shoe is angled to drive staples at proper angle. Tapping block is included, and staples for this unit are sold in store. * Please call us for any questions on our floor stapler 3/8 inch laminated rentals in Hillsdale and Ridgewood NJ.